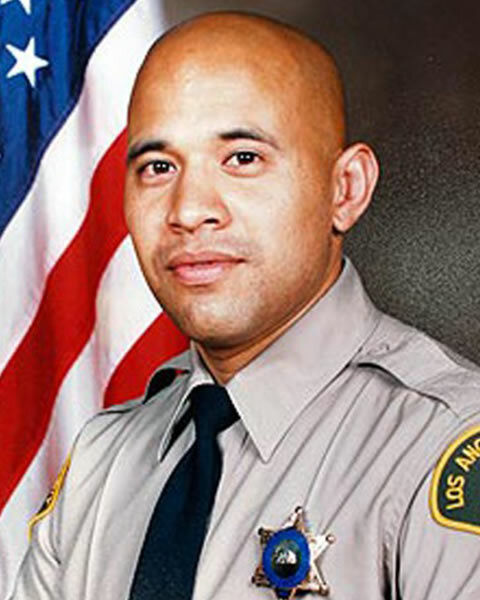 Deputy Sheriff Juan Escalante was shot and killed when he was confronted by two armed gang members in front of his home as he prepared to leave for work. Deputy Escalante drew his weapon and identified himself as a deputy before being fatally shot. The subject who shot Deputy Escalante knew that he worked as a deputy at the Central Jail and shot him in retribution for a shooting six months earlier in which the suspect’s cousin was shot by a LAPD police officer. Deputy Escalante was not involved in the previous shooting. When the gang member spotted Deputy Escalante he told the man driving to the car to stop and two of the gang members got out to confront him. The suspects opened fire when Deputy Escalante identified himself. Four subjects, including the gang member who shot Deputy Escalante and the man who provided the firearm, were arrested and charged in connection with his murder. On September 14th, 2010, the driver of the car pleaded no contest to voluntary manslaughter and was sentenced to 14 years in prison. In October 2012 the subject who shot Deputy Escalante pleaded guilty to murder and other charges and was subsequently sentenced to life in prison without the possibility of parole. A fifth suspect was arrested in Mexico in December 2012; a sixth suspect has been identified, but is still at large and wanted by the Los Angeles Police Department. Deputy Escalante was a member of the U.S. Army Reserves and had served with the Los Angeles County Sheriff’s Department for 2-1/2 years. He is survived by his wife and three children.